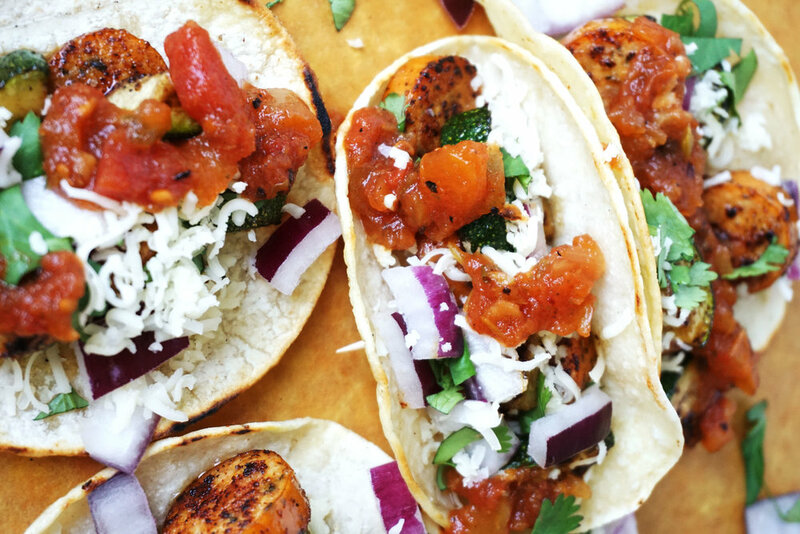 Tacos loaded with juicy chicken sausage and crisp zucchini, and sprinkled with creamy aged white cheddar cheese are a twisted Taco Tuesday must - prepared in just one pan in under 30 minutes. As I prepare for my senior year (!!!!) - emphasis on the fact that I am four years deep into college - I experienced something most other students probably experienced their freshman year: sometimes, movie theatre popcorn + ice cream sandwiches + carrots = dinner. I am so for-real right now, it's almost not even funny. Except it really was funny because my best friend, who also thrives on a diet of mostly healthy foods with the occasionally cherished donut or 5th glass of wine (mhm) or third slice of the cheesy, greasy Costco pizza we all know and love. We sat in the movie theatre - and I should mention we had free tickets because we wouldn't have paid to sit in comfy chairs and watch a rom-com we could find on Netflix soon enough - with our medium-sized bucket of buttery popcorn and giggled. We giggled with childlike excitement at the reclining chairs you'd only think to find at a store like Brookstone, at our hands simultaneously reaching into the bucket for popcorn, at the similarities of our best-friendship to another's romantic relationship (we like boys, but we do spend copious amounts of time doing together doing "couple things"), and at the pure joy that radiated from our smiles and echoed from our non-stop laughter. That being said, my frequent "fancy" dinners (as the college students who consider popcorn + ice cream dinners a regular thing) deserve attention. I shine the spotlight on this one, specifically, because not only did I never see it coming - I was vegan, if you're new here - but also because chicken sausage. Did you know - you probably didn't - that, when I was a kid, Santa used to fill my stocking with Wisconsin sausage? Mmmmmhm. Again, I'm so for-real right now it actually is funny. Because I don't know anyone else - excuse me, I don't know any other once-vegan college girls like myself - who used to receive sausages as a Christmas gift. And, I should add, cherished said sausages as one of their favorite gifts. I'm still crossing things off my "non-vegan to-do list", as I call it, and I felt such childlike excitement like the kind in the movie theatre the other night when I purchased a package of chicken sausages for myself. At first bite, I almost wanted to apologize to something or someone for deserting my once-favorite food for years. Movie theatre popcorn (with the butter, people... WITH the butter) and ice cream sandwiches were on the to-do list as much as the chicken sausage. Despite their vast differences, I cherished them almost the same. Though I enjoyed these tacos as a single girl and the popcorn + ice cream with my best friend, I find the enjoyment of both stemming from a breath-taking sense of actual freedom around food. And with that, I can say nothing more, except that chicken sausage is fantabulous (especially this brand) and this cheese is phenomenal (also because it is semi-affordable if you find this one) and, as much as I hope you include treats like ice cream and movies purchased mostly for the comfort of the reclining chairs, I hope you spend quality time playing around in the kitchen with foods you love and foods you've not loved but want to try. I GIVE YOU TACOS (the best ones I've made at home myself *toot toot*). Heat a large nonstick skillet over medium heat and coat with 2 tbsp. grapeseed oil. Saute the garlic until golden brown and then add in the chicken and zucchini. Increase heat to medium-high and cook until lightly charred. Transfer to a bowl and set aside. Reduce the heat to medium-low and coat the pan with remaining oil. Carefully lay in the tortillas and pan-fry until golden-brown on each side. Transfer to a plate and set aside. Assemble the tacos - evenly distribute the sausage and zucchini atop each tortilla, then top with red onion, cilantro, and salsa. Grate the cheese over each taco. Serve immediately with any additional toppings (I recommend hot sauce! ).